We went for our usual walk last night, and she seemed to be in a hurry to get home. Near the end of our walk she kept bumping into me and looking at me with big brown eyes as if to say "can we go home?" When we got home she didn't want to go to the back yard as usual. We came in and she laid down. Later on, when we went to go to bed, she tried to climb the stairs, and she nearly fell. If this story sounds familiar, it's because it is. Except before, that story was about my husband's last night at home. Needless to say I was scared! I tried to get a hold of anyone but of course everyone was asleep.I laid on the couch with my pup, she climbed right on top of me, and I eventually fell asleep for about an hour or so. I still couldn't get a hold of anyone, but eventually I just drove to the vet to wait for them to open, but thankfully, they had just opened when I got there. The vet wasn't there yet so we had to wait a bit but that was ok, the vet saw us as soon as she got in. 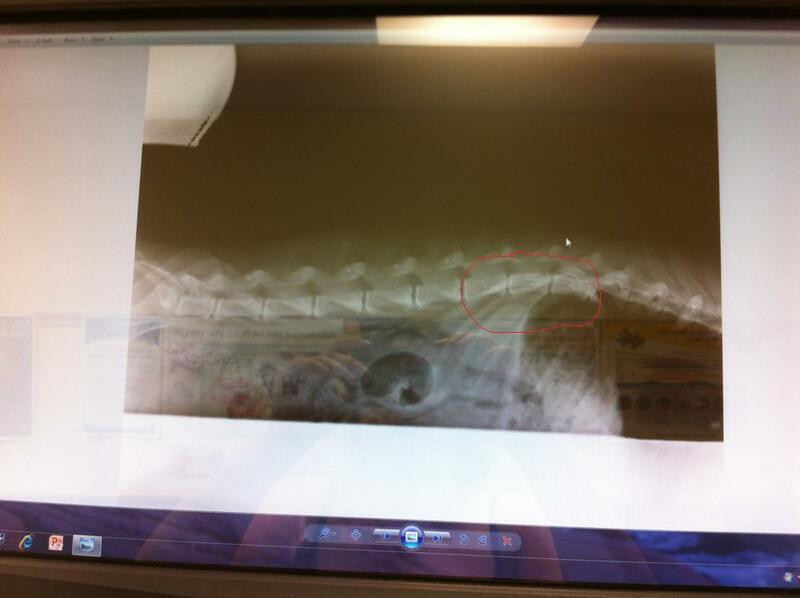 After an xray, it was discovered that emma has symptoms of an intervertebral disk disease. She seems to have a slipped disc. You can see in the photo above where I circled the bones that are squished together. Compare to the other bones with more space between them. She was given some medication and we are at home now with instructions not to go for walks or climb stairs or jump on anything. If it gets worse, she may have surgery. She's doing a bit better now and just wobbly but hasn't really moved since we got home. Poor pup. Poor Emma! Sending lots of prayers for you both. I'm hoping today things are looking brighter. Poor Emma! And I'm sure this put horrible memories in your head. Hugs to you. Oh dear, poor Emma. I am so sorry about this Ter, I know you must of been terrified. I hope she is resting and feeling better. Oh, the poor little thing. I sure hope she has a quick recovery, Ter. Ter, how is Emma doing? I didn't see any updates. Hope she is doing better now.